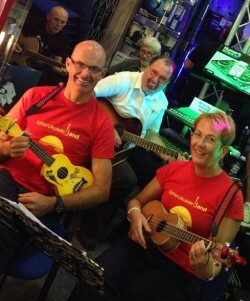 The ukulele is a lovely, small, accessible, portable instrument, and through our Beginners Ukulele Course, you will see that it brings a smile to your face when you play it. If you are a total beginner and would like to take the first steps slowly, then give this group a try. 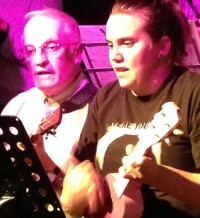 This Beginners’ Ukulele Course is a series of 6 fun and instructive 1 hour sessions. Groups are small with a maximum of 8 beginners in any one class. Beginners only are permitted onto this course and assessed for suitability before signing up, so you will be in the company of people of the same standard to you. Once this course is complete, participants will have the option to join improver courses and/or the Igloo Band. Additional training sessions available. All members, no matter how new or experienced, are also encouraged to come to our sociable jam nights to meet more musicians and have a ‘group practice’, which really helps embed skills and develop musicianship. you will be coached and mentored through the process of learning, and supported at every stage. Times : Wednesdays evenings, Saturday mornings. Saturdays 11.30-12.30 – 21st April – book here.